So I decided to write this post. In an unforgettable scene from Rob Reiner’s “The Princess Bride”, Fezzik is climbing a rope, ascending “The Cliffs of Insanity”, with Vizzini, Inigo and the princess, all strapped to his massive body. The Man in Black, is also climbing and he is gaining. 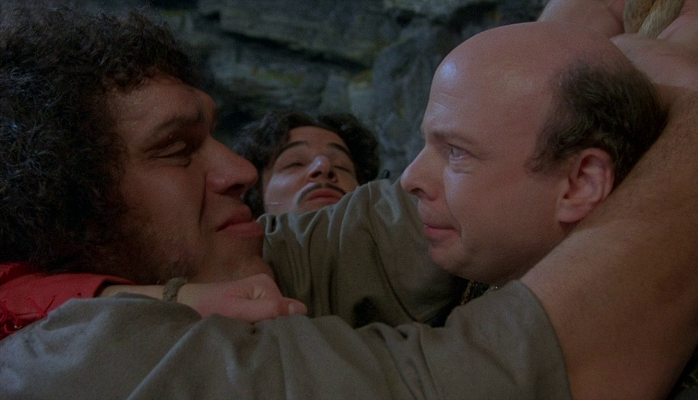 Vizzini: You were supposed to be this colossus, you were this great legendary thing, and yet he gains! Fezzik: Well, I’m carrying three people, and he’s got only himself. Vizzini: I do not accept excuses! I’m just going to have to find myself a new giant, that’s all. Here’s the thing, everybody likes complaining about how corporations (especially large ones that they work in) are sluggish, siloed, bureaucratic and uncreative. And they are! Not only the failing ones. In fact, my guess is that all corporations above a certain threshold (a combination of number of employees and accumulated number of people-years invested) are slow and siloed and intrinsically resistant to innovation and change. If they are all like that, perhaps there is a reason. My contention is that they are like that because it serves (or served) certain corporate purposes very effectively. Corporations that focus on risk reduction, share-value appreciation, economies of scale (cost reduction), all in a relatively slow moving environment, need(ed) repetitive, highly focused, incremental steps and adjustments. Silos are great for that – they create insulated process-environments that work very efficiently as long as nothing changes from the basic pattern. Creative thinking is not useful in delivering well-defined, low risk, slow to change deliverables…They are like that because that was their “ecological niche” – and they adapted perfectly. Like Fezzik, we are yelling at them: “Faster!” And they respond: “we thought we were going faster”. Somebody changed the rules, somebody introduced technologies and processes that are so radically faster, they cannot compete. The implications are also a bit “heavy”. Large sluggish corporations, like Fezzik, will not become the agile and with great reflexes, Man in Black. Shouting at them and trying to force them to become that, will not yield results. The silos will not be broken. The bureaucracy will not be eliminated and they will not become cliff-climbing-sprinters. This analogy to Fezzik, I stumbled upon (although it is definitely one of my favorite movies), actually continues all along to movie. Westley (the man in black for those of you who did not see the movie – stop everything you are doing, go watch it and come back) subdues Fezzik in a fight. Fezzik explains that his technique is mainly effective in fighting gangs and that fighting something small and fast is difficult. There are other examples where this analogy sticks – tell me what they are in the comments.